As I write, the country is once again remembering the ‘Emergency’ which was imposed upon India by Mrs Indira Gandhi’s government on June 25, 1975 and lifted 21 months later, on March 21, 1977. Those of us who experienced the censorship, the near-shutdown of public debate and the subtle but all-pervasive atmosphere of terror that prevailed during those two years will never forget it. But three-quarters of today’s Indians had not even been born when it was imposed on the country, and nine-tenths were not old enough to feel its consequences. So as the years have rolled by the Emergency has faded from the popular consciousness, and its remembrance has become routine. The common view today is that the Emergency was triggered by one person’s hubris, bordering on megalomania. Indira Gandhi was convicted of electoral malpractices by the Allahabad high court. The law required her to step down and withdraw from parliament, but she refused to do so. She was forced to lift the Emergency when she realised that her own party did not support its indefinite extension. From this has sprung the belief that in the long run, the Emergency served a salutary purpose, for it made people value their democratic freedoms and taught future governments the lesson that authoritarian rule will be impossible to maintain indefinitely in a country as large and heterogeneous as India. Paradoxically, therefore, Indira Gandhi made Indian democracy safe forever. This cosy belief is founded on sand. With the passage of time, evidence has surfaced in documents and memoirs that Indira Gandhi never intended the emergency to be permanent. Alongside this, the passage of time has also erased most of the lessons the country had learned from that experience. Today we once again take our democracy for granted. But far from being safe, it is imperilled once more as it has never been before, and almost no one seems to be aware of it. The Allahabad court verdict did in fact trigger the Emergency, but not because it posed an immediate threat to Mrs Gandhi’s rule. She did not have to step down after the Allahabad court ruling because Justice Krishna Iyer of the Supreme Court had allowed her to continue functioning as prime minister without a vote in parliament till her appeal had been heard by a full bench of the Supreme Court after the summer recess. The suggestion that she should declare a national Emergency, had in fact been made by Siddhartha Shankar Ray, the chief minister of West Bengal, in a letter on January 8, 1975, six months before the judgment. Ray made his recommendation on the grounds that it had become necessary to stave off a creeping spread of anarchy and breakdown of government throughout the country. In an anniversary article written a year ago, Outlook magazine accused him of making this suggestion when there was no trouble in the country. This was very far from the truth. Ray made the suggestion only five days after the assassination of railways minister L.N. Mishra by means of a bomb placed under the dais at a public meeting in Bihar. To a generation that has become inured to witnessing horrifying public executions and bombings on television and computer screens, this may not sound like much. But those were the days before Leila Khalid hijacked the first airliner in the sky, and only two policemen guarded the gates of 1, Safdarjang Road, where Mrs Gandhi lived. The shock Mishra’s death gave to the government should not, therefore, be underestimated. What is more, the attack on Mishra did not come out of the blue, but after 13 months of growing turmoil in the country that began with a student-led rebellion against Congress chief minister Chimanbhai Patel in Gujarat in December 1973. The catalyst was a belief that at a time of drought and hardship, Patel had manipulated edible oil prices to benefit family and friends. Mrs Gandhi first tried to propitiate the students by making Chimanbhai Patel resign, declaring president’s rule and putting the assembly into suspension. But this turned out to be a tactical mistake for, sensing weakness, the entire opposition, from the communists to the Jana Sangh and Congress (O), joined the students and raised their demand to a dissolution of the Gujarat vidhan sabha and the holding of a new election. When Morarji Desai went on a fast to force the issue, Indira Gandhi, despite having 148 seats in the 168 seat assembly, gave in a second time and dissolved the house in March 1974. This proved her second mistake, for it emboldened the opposition and turned what had begun as a legitimate expression of grievance into an illegitimate attempt to force regime change through coercion. Within days, the movement spread to Bihar. By June 1974, it had spread to Karnataka, UP and Punjab. In the words of P.N Dhar, Mrs Gandhi’s principal secretary at the time, “Nobody shed a tear for the demise of the rule of law and constitutional means of changing governments”. What particularly incensed Indira Gandhi was the role that the veteran socialist leader Jayaprakash Narayan, who had been a close associate of Pandit Nehru and his family, played in fanning the unrest. JP had visited Gujarat in February 1974 and been impressed by the Navnirman movement. When a newly formed organization, the Bihar Rashtriya Sangharsh Samiti, approached him in April 1974 , he readily agreed to lead the movement. According to Dhar, L.N Mishra’s assassination strengthened Mrs Gandhi’s suspicion that a conspiracy was developing to bring her government down. Her suspicion was confirmed when two Anand Margis (who finally ran out of appeals in 2014) made an attempt to kill Chief Justice A.N Ray, whom Mrs. Gandhi had elevated after superseding three other Supreme Court judges. But even this did not convince her of the need to declare an Emergency. It required two more setbacks to make her change her mind. The first was the opposition’s totally unexpected victory in the Gujarat state election on June 12. The second was JP’s call to the people at the Ramlila grounds in Delhi after the Allahabad judgment, to refuse to cooperate with the government, or pay taxes to it, till Mrs Gandhi stepped down. These developments convinced her that a kind of hysteria was spreading through the nation and that the opposition had no intention of respecting the law and due process, or of allowing her to continue as head of the government till her appeal had been heard. The evidence that Mrs Gandhi never intended the Emergency to be permanent is equally unambiguous. The late K.C. Pant told me in the late 1980s that after the cabinet meeting of June 25, 1975, he had asked her without equivocation whether she intended the Emergency to be temporary. She had said “of course” with a hint of asperity that he should even have doubted this. P.N. Dhar recorded in his memoirs that in the closing months of 1976, Mrs Gandhi knew that Sanjay, backed by cronies like Bansi Lal and V.C Shukla, was all for extending the life of parliament beyond January 1977. But she was not convinced that this would be wise. She had therefore asked Dhar for a note on the subject. In it he had advised an early election because the gains from the Emergency had been exhausted and the losses had begun to mount. Dhar then began to notice that she was keeping Sanjay out of her discussions about the elections, electoral arrangements, and constitutional reform. Her January 18 announcement ending the Emergency and announcing elections in March, therefore, took Dhar and everyone around her – including Sanjay – completely by surprise. Dhar knew that by then the ‘agencies’ had surmised that she would lose the election if one was held. He concluded that she had gone ahead because she considered the alternative to be far worse. In sharp contrast today, the Narendra Modi government is driving the country towards an Emergency with a cold blooded efficiency that has only unflattering historical parallels. In one of the first speeches he gave after coming to power, Modi referred to his plans for the next 10 years in terms that belied any possibility of there being a change of government or prime minister. Since then, many of his ministers, and his party president Amit Shah, have made similar statements. This is because they see their function as being the transformational one of exorcising the weakness in the Indian, specifically Hindu, psyche that has led to its centuries of “enslavement,” and of creating a strong, self-assertive Hindu nation that will command respect through its strength, by inspiring fear. Such a transformation will take time. To distinguish itself from what they consider their weak-kneed, pseudo-secular predecessor and its cohorts of western educated advisers, this government has plunged the country into a campaign of terror against an unarmed populace in Kashmir; earlier, it engineered an undeclared trade blockade upon Nepal for daring to disregard Modi’s advice on the framing of its constitution, and pushed that country into the arms of China; it has greatly worsened India’s strained relations with Pakistan and destroyed all the progress that Manmohan Singh’s government had made towards letting the border dispute with China fade away behind deepening cooperation on the remaking of the post-cold-war international order. However, these calculated provocations fade into insignificance before the BJP’s systematic assault upon the rule of law at home. One of the earliest incidents was the planting of a doctored tape showing JNU Student Union president Kanhaiya Kumar allegedly mouthing ‘Pakistan Zindabad’, at a confrontation with the BJP’s student wing, the Akhil Bharatiya Vidyarthi Parishad, on the JNU campus and using it to arrest him and put him in jail. Although voicing pro-Pakistani slogans is not a crime under the Indian Penal Code, and although the tape was exposed by two TV channels to be a fake, the government kept Kumar in jail for three weeks. While he was in police custody, three lawyers belonging to one of the RSS’s shadow organisations, the Adhivakta Sangh, beat him while the police looked on. They then boasted about it to an India Today reporter who carried out a sting operation on them with a hidden camera. But all the police did to them was to invite them to appear at the thana, book them and release them immediately on bail at their own cognisance. The Bharatiya Gau Raksha Dal claims that it has 50 affiliated organisations with about 10,000 volunteers. But hundreds of other self-appointed cow protection groups have sprung up all over the country. Delhi is believed to have 200 such groups, and the Una region of Gujarat is believed to have an equal number. On July 1, 2016, 35 gau rakshaks attacked seven Dalits for skinning a cow that had been killed by a lion, in a village adjoining the Gir forest, accused them of slaughtering it, beat them with iron rods and sticks, then kidnapped four of them, took them to Una, tied them to a car, and flogged them publicly through the town. The perpetrators videographed the beating, replaced their screams with an overlay of soothing western classical music, and uploaded their tape onto YouTube. Seven Dalits were admitted to hospital, but the police just looked on. The BGRD and the Adhivakta Sangh are only small portions of the stormtrooper army that the RSS has assembled. 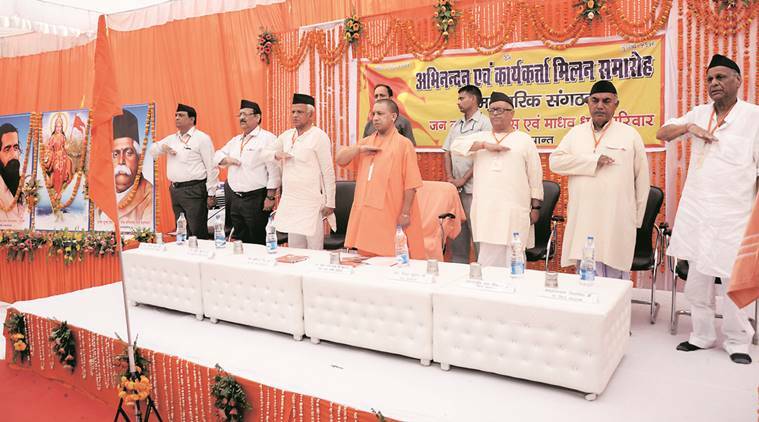 A third component is the Hindu Yuva Vahini of Gorakhpur, which describes itself as “a fierce cultural and social organisation dedicated to Hindutva and nationalism.” The HYV was created by the Muslim-hating firebrand chief minister of UP, Yogi Adityanath. It has been involved in numerous riots, notably one at Mau in 2005, and was called out by Adityanath to help the police in his first action as chief minister – the closure of what he and the Vahini claimed to be illegal slaughter houses. Adityanath and his Hindu Yuva Vahini have been the prime instigators of the campaigns of ‘Love Jihad’ and ‘Ghar Wapsi’, both of which were designed to show the Muslims of north India their place in the new dispensation, and resulted in scores of attacks on Muslims and several deaths. But throughout the past three years of Modi’s rule, there have been few arrests, prompt releases on bail and almost no prosecutions. The police and the judges too, have by and large learned which side of their bread has the butter. But all this pales before this new RSS/BJP’s utter disregard for the canons of democracy. Smarting under his total rout at Kejriwal’s hands in the 2015 state election Modi launched an assault on the AAP of a kind that has no place in a democracy. This developed in three phases. In the first it concentrated on making the government impotent. Through lieutenant governor Najib Jung, it took the Anti-Corruption Bureau out of the Delhi government’s hand, and closed down the helpline through which the ACB had received 160,000 complaints from the public of extortion by the police and officers of the three municipalities. It followed this with a home ministry circular that took all effective decision making power out of the state governments hands, even on subjects that had nothing to do with the police and land, the two subjects reserved for the central government. The second phase of the attack was triggered by an extraordinary judgment of a single judge bench of the Delhi high court, that invalidated not one but two articles of the Indian Constitution, 293 and 293A, to bring Delhi (and as collateral damage also Pondicherry) back completely under the Centre’s thumb. Following this Jung seized 400 files and sent anything that could conceivably be considered ‘irregular’, to the CBI to follow up. This was followed by a spatter of accusations of petty irregularities, mostly made through TRP hungry TV channels, and ‘friendly’ print journalists to discredit the government, and create the impression that it was no better, and probably worse than any other. Modi launched the third phase with direct attacks on Kejriwal and his deputy chief minister Manish Sisodia, accusing them of corruption, money laundering and embezzlement of funds as a prelude to splitting the party and forcing it to resign. To do the latter it used two AAP members, Kumar Vishwas and Kapil Mishra, who had come to it from the RSS in the heady days of the “India Against Corruption” movement and kept their ties with it. It would be tedious to describe the details of this attack. Suffice it to say that the main charge, made by Mishra, that he had personally seen Kejriwal receive Rs 2 crore of foreign donations from health minister Satyendra Jain at his house on a particular date, was not corroborated by any of the cctv cameras mounted around the CMs house. This has not prevented the Delhi police from filing no fewer than 29 cases against Kejriwal, the elected chief minister of the state. Kejriwal is not the only opposition chief minister upon whom Modi and Amit Shah have trained their guns. The ministers of Mamata Banerjee, who is the first chief minister to have publicly recognised the threat that the BJP poses to democracy, have been in the gunsights of the CBI, the Income tax authorities and the enforcement directorate for several months. The common thread in all they are doing is their utter disregard for the rule of law and contempt for the conventions upon which democracy rests. Modi and Shah have to know that anything the BJP does to its political rivals can, and will, be done by them to the BJP when they come to power. With scandals like Vyapam in Madhya Pradesh, and the Rajasthan land scam, there will be ample fodder for the opposition to chew upon. So why are they showing such disregard for what can happen to them in the future? For those who have the courage to look ahead, the answer is staring them in the face: they do not ever expect the opposition to come to power. And that can happen only if democracy is extinguished in India. Indira Gandhi’s Emergency was only a momentary flash in the pan. The real Emergency lies ahead. Note: An erroneous reference to Siddhartha Shankar Ray as the governor of West Bengal has been corrected. He was, in fact, the chief minister of the state.